Pfc. 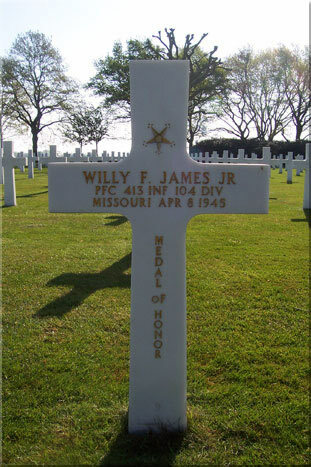 Willy F. James jr.
101st Airborne division, 502th PIR, 3rd Bat. For gallantry and intrepidity at the risk of his own life, above and beyond the call of duty on 11 June 1944, in France. 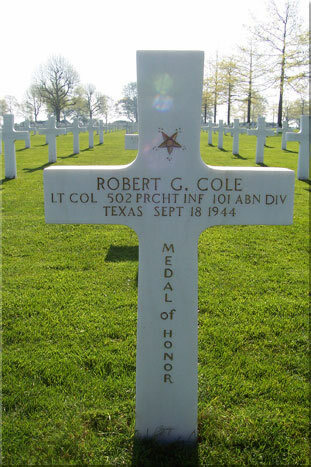 Lt. Col. Cole was personally leading his battalion in forcing the last 4 bridges on the road to Carentan when his entire unit was suddenly pinned to the ground by intense and withering enemy rifle, machinegun, mortar, and artillery fire placed upon them from well-prepared and heavily fortified positions within 150 yards of the foremost elements. After the devastating and unceasing enemy fire had for over 1 hour prevented any move and inflicted numerous casualties, Lt. Col. Cole, observing this almost hopeless situation, courageously issued orders to assault the enemy positions with fixed bayonets. With utter disregard for his own safety and completely ignoring the enemy fire, he rose to his feet in front of his battalion and with drawn pistol shouted to his men to follow him in the assault. Catching up a fallen man's rifle and bayonet, he charged on and led the remnants of his battalion across the bullet-swept open ground and into the enemy position. His heroic and valiant action in so inspiring his men resulted in the complete establishment of our bridgehead across the Douve River. The cool fearlessness, personal bravery, and outstanding leadership displayed by Lt. Col. Cole reflect great credit upon himself and are worthy of the highest praise in the military service. survive his MOH winning action. 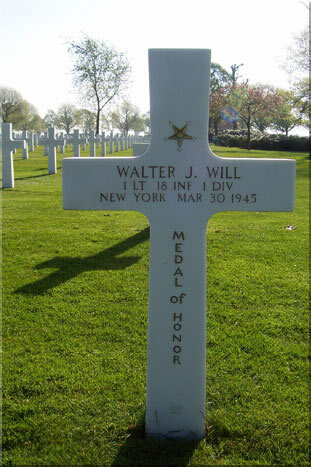 He later was killed at September 18, 1944 in The Netherlands during operation Market-Garden. For extraordinary heroism in action on 7 April 1945 near Lippoldsberg, Germany. As lead scout during a maneuver to secure and expand a vital bridgehead, Private First Class James was the first to draw enemy fire. He was pinned down for over an hour, during which time he observed enemy positions in detail. Returning to his platoon, he assisted in working out a new plan of maneuver. He then led a squad in the assault, accurately designating targets as he advanced, until he was killed by enemy machine gun fire while going to the aid of his fatally wounded platoon leader. 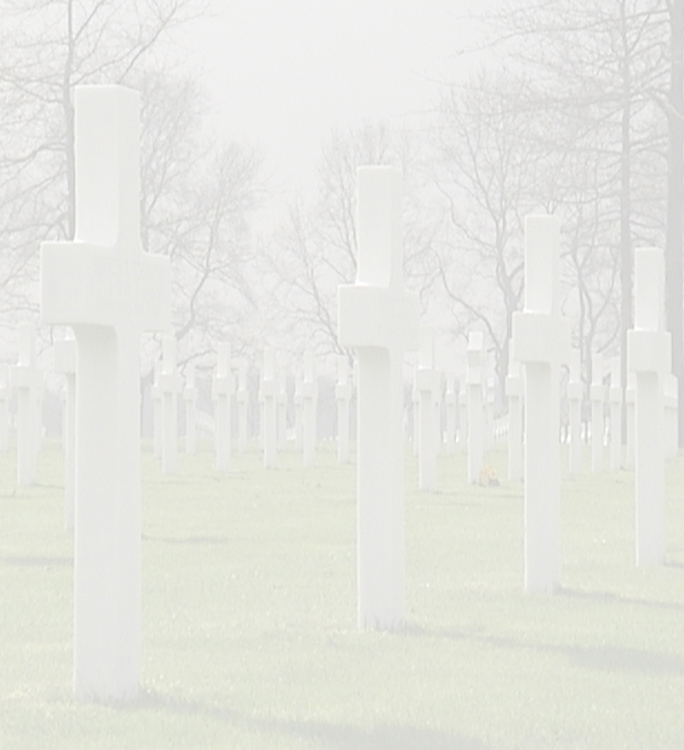 Private First Class James' fearless, self-assigned actions, coupled with his diligent devotion to duty exemplified the finest traditions of the Armed Forces. No African American soldier was awarded the Medal of Honor during World War II. In 1993 the Army contracted Shaw University in Raleigh, North Carolina, to research and prepare a study "to determine if there was a racial disparity in the way Medal of Honor recipients were selected." Shaw's team researched the issue and, finding that there was disparity, recommended the Army consider a group of 10 soldiers for the Medal of Honor. Of those 10, seven were recommended to receive the award. In October of 1996 Congress passed the necessary legislation which allowed the President to award these Medals of Honor since the statutory limit for presentation had expired. The Medals of Honor were presented, by President William Clinton, in a ceremony on 13 January 1997. Vernon Baker was the only recipient still living and present to receive his award; the other six soldiers received their awards posthumously, with their medals being presented to family members. Willy F. James jr. was one of them. 17th Airborne division, 507th PIR, G-Co. He was an acting platoon sergeant with Company K, near Eisern, Germany. When his company encountered an enemy battalion and came under heavy small-arms, machinegun, and mortar fire, the 2d Platoon was given the mission of flanking the enemy positions while the remaining units attacked frontally. S/Sgt. Peterson crept and crawled to a position in the lead and motioned for the 2d Platoon to follow. A mortar shell fell close by and severely wounded him in the legs, but, although bleeding and suffering intense pain, he refused to withdraw and continued forward. Two hostile machineguns went into action at close range. Braving this grazing fire, he crawled steadily toward the guns and worked his way alone to a shallow draw, where, despite the hail of bullets, he raised himself to his knees and threw a grenade into the nearest machinegun nest, silencing the weapon and killing or wounding all its crew. The second gun was immediately turned on him, but he calmly and deliberately threw a second grenade which rocked the position and killed all 4 Germans who occupied it. As he continued forward he was spotted by an enemy rifleman, who shot him in the arm. Undeterred, he crawled some 20 yards until a third machinegun opened fire on him. By almost superhuman effort, weak from loss of blood and suffering great pain, he again raised himself to his knees and fired a grenade from his rifle, killing 3 of the enemy guncrew and causing the remaining one to flee. With the first objective seized, he was being treated by the company aid man when he observed 1 of his outpost men seriously wounded by a mortar burst. He wrenched himself from the hands of the aid man and began to crawl forward to assist his comrade, whom he had almost reached when he was struck and fatally wounded by an enemy bullet. S/Sgt. 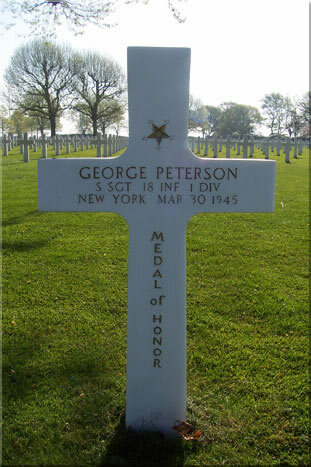 Peterson, by his gallant, intrepid actions, unrelenting fighting spirit, and outstanding initiative, silenced 3 enemy machineguns against great odds and while suffering from severe wounds, enabling his company to advance with minimum casualties. 8st Infantry division, 13th Infantry, AT-Co.
Pfc. 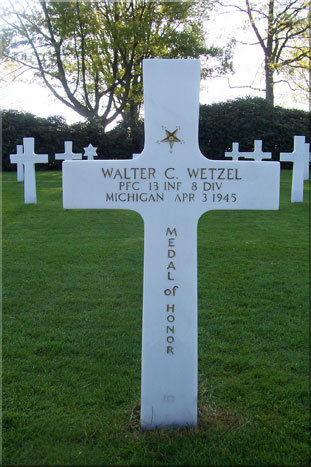 Wetzel, an acting squad leader with the Antitank Company of the 13th Infantry, was guarding his platoon's command post in a house at Birken, Germany, during the early morning hours of 3 April 1945, when he detected strong enemy forces moving in to attack. He ran into the house, alerted the occupants and immediately began defending the post against heavy automatic weapons fire coming from the hostile troops. Under cover of darkness the Germans forced their way close to the building where they hurled grenades, 2 of which landed in the room where Pfc. Wetzel and the others had taken up firing positions. Shouting a warning to his fellow soldiers, Pfc. Wetzel threw himself on the grenades and, as they exploded, absorbed their entire blast, suffering wounds from which he died. The supreme gallantry of Pfc. Wetzel saved his comrades from death or serious injury and made it possible for them to continue the defense of the command post and break the power of a dangerous local counterthrust by the enemy. His unhesitating sacrifice of his life was in keeping with the U.S. Army's highest traditions of bravery and heroism. He displayed conspicuous gallantry during an attack on powerful enemy positions. He courageously exposed himself to withering hostile fire to rescue 2 wounded men and then, although painfully wounded himself, made a third trip to carry another soldier to safety from an open area. Ignoring the profuse bleeding of his wound, he gallantly led men of his platoon forward until they were pinned down by murderous flanking fire from 2 enemy machineguns. He fearlessly crawled alone to within 30 feet of the first enemy position, killed the crew of 4 and silenced the gun with accurate grenade fire. He continued to crawl through intense enemy fire to within 20 feet of the second position where he leaped to his feet, made a lone, ferocious charge and captured the gun and its 9-man crew. Observing another platoon pinned down by 2 more German machineguns, he led a squad on a flanking approach and, rising to his knees in the face of direct fire, coolly and deliberately lobbed 3 grenades at the Germans, silencing 1 gun and killing its crew. With tenacious aggressiveness, he ran toward the other gun and knocked it out with grenade fire. He then returned to his platoon and led it in a fierce, inspired charge, forcing the enemy to fall back in confusion. 1st Lt. Will was mortally wounded in this last action, but his heroic leadership, indomitable courage, and unflinching devotion to duty live on as a perpetual inspiration to all those who witnessed his deeds. In this same action SSgt. 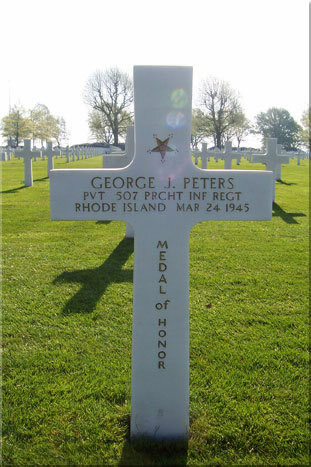 George Peterson earned his MOH.